Co-operatives (or “co-ops”) are owned by their members who use their services or purchase their products. Co-ops can provide virtually any product or service, and can be either non-profit or for-profit enterprises. They are businesses that are democratically controlled by the members/owners, and are based on ethical values and principles including self-help, democracy, equality, and concern for community. As the original social enterprise, co-ops serve a range of sectors, including finance, housing, service, food, worker, agriculture, youth, social and community. They are an expression of the power people have when they recognize their common interests and act collectively. For a chart on how co-ops differ from investor-owned businesses, click here . 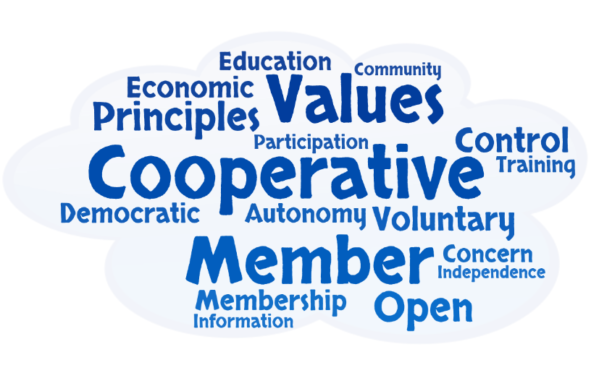 Possessing a high degree of collective entrepreneurship, the co-operative business enterprise model is inherently ethical in its treatment of its members, employees, other stakeholders and the environment. Co-ops are founded on a common idea – that people know what’s best for themselves. Through co-operation, people work together to meet their common needs. The primary purpose of co-operatives and credit unions is to meet the common needs of their members, whereas the primary purpose of most investor-owned businesses is to maximize profit for shareholders. The primary purpose of a worker’s cooperative is to provide stable and meaningful work for its members. Co-operatives and credit unions use the one member/one vote system, not the one vote per share system used by most businesses. This helps the co-operative or credit union serve the common need rather then the individual need and is a way to ensure that people, not capital control the organization. SSG is taking this one step further by using consensus decision-making for governance and operations of our co-operative. Co-operatives and credit unions share profits among their member-owners on the basis of how much they contribute to the co-op, not on how many shares they hold. Co-operatives and credit unions invest their profits in improving service to their members and improving the well-being of their communities. SSG is also committed to reinvesting a portion of our revenue back into the communities in which we live and work in order to support non-profit, advocacy, and social entrepreneurship. In the Kootenay and Boundary Regions of Southeastern British Columbia, where the Co-op Council resides, there are over 40 incorporated co-operatives, including several credit unions, food co-ops, radio stations, artisans’ co-ops, land co-ops, housing co-ops, social service co-ops and carshare services that all do business co-operatively. View the UCCC Co-op Impact to see a graphic showing the impact of our local and national co-ops.